One of the first things I challenged myself to learn when I first started baking was to make a killer apple pie. I think it took me about 20 to 30 apple pies to get the recipe right, with the consistency and flavor I liked. At first I started using the frozen pie crusts that you find at the stores because I was too intimidated to make my own thinking it was something only for experienced pie makers. I have to be honest and say that my first pie crusts were not something to be proud of because I really didn’t know what I was doing. They were dry, bland, salty and hard as a rock but the more I made them, the more I got the hang of it. And that’s exactly what it takes, practice. Making pie crusts is not as difficult as we all think it is, but it does take practice, lots of it. In this recipe I will show you the old school way of making pie crusts which is all done by hand with the use of a fork or a pastry blender and lots of elbow grease. The second way of making it, which is my preferred method, is using a food processor to do the hard work for you. You put everything in and in less than five minutes you have a nice and smooth dough to work with. So, I leave it up to you, whichever way you choose to make it will work just fine. 1. On a flat surface mix flour, salt and sugar. 2. Then add the cold butter and blend it with a fork or pastry blender until the mixture resembles small peas. Try not to touch the butter or mixture with your hands so the butter remains as cold as possible. Add about 2-3 tbsp of ice cold water at a time to the dough and keep blending with the fork until it starts sticking together and you’re able to form a ball. 4. Shape the dough into a small, flat disc on a floured surface. Wrap it in plastic wrap and place it in the refrigerator for at least one hour. 1. In a food processor add the flour, salt and sugar and pulse a few times to mix. 4. Shape the dough into a small, flat disc. Wrap in plastic wrap and place in the refrigerator for at least one hour. 1. 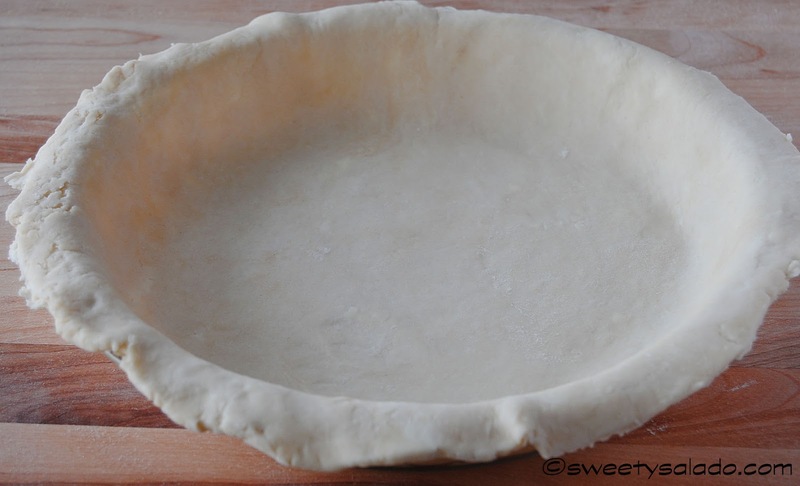 Take the pie disc from the refrigerator, unwrap it and place it on a floured surface. 2. Start rolling out the dough to form a circle with a rolling pin until it’s big enough to cover your pie dish. 3. 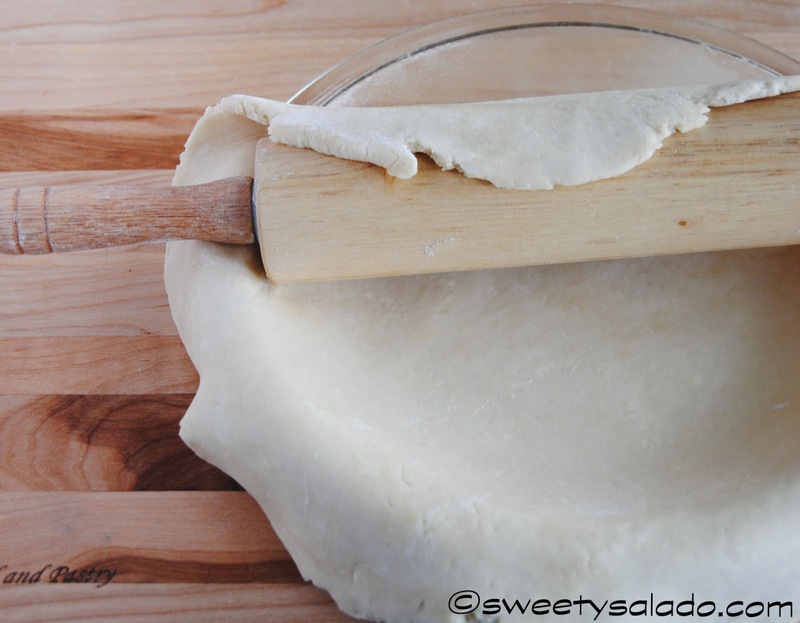 To place the dough on the pie dish, wrap the rolling pin with the pie crust, then place the dish under the rolling pin and start unrolling the pie crust onto the dish. Shape pie crust into the dish, cut off the excess dough with a knife and fill and bake according to the pie recipe you’re making. 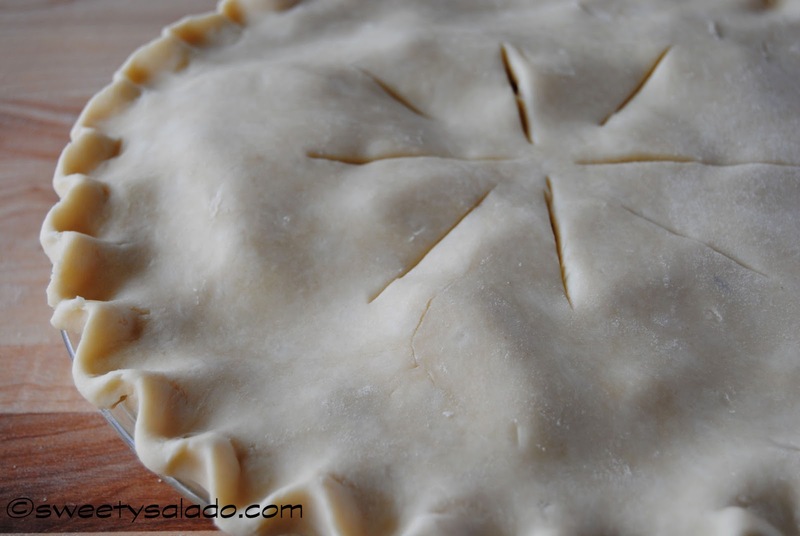 Note: This pie crust will last up to 1 week in the refrigerator or up to 1 month in the freezer.